After days of denials that the NSA was doing anything surreptitious to the American people, NSA Director Keith Alexander has gone on the record admitting that thousands of NSA spies -- which he calls "analysts" -- really do listen to your phone calls and read your emails. And they don't need a warrant to do either one. This has come to the surface via New York Democrat Rep. Jerrold Nadler, who was secretly briefed on the capabilities of the NSA spy system. He revealed that if the NSA wants to listen to your phone calls, nothing more is required than an NSA analyst making the decision to do so. "I was rather startled," said Nadler in a CNET news story. As CNET explains, "Not only does this disclosure shed more light on how the NSA's formidable eavesdropping apparatus works domestically, it also suggests the Justice Department has secretly interpreted federal surveillance law to permit thousands of low-ranking analysts to eavesdrop on phone calls." All the denials, then, are false (as we told you all along). The NSA is not only listening to your phone calls whenever it wants, without a warrant; it's also reading your emails, scanning your documents and archiving all your electronic communications for future abuse of your privacy. Why else would the NSA need a multi-billion-dollar data center in Utah? The purpose of the facility, of course, is to create an infrastructure which can store even more data that's illegally siphoned off from the private accounts of the American people. Listening to the phone calls of Americans is illegal, by the way. Even under FISA and the Patriot Act. Those acts were written to allow the NSA to target foreign operatives, not domestic Americans. This means the NSA is committing probably over a million felonies each day, since snooping on the phone calls or emails of an American citizen is, of course, a felony crime. Binney: The former FBI agent, Tim Clemente, says they can get access to the content of any audio, any phone call. He says that there are no digital communications that are safe or secure. So that means that they were tapping into the databases that NSA has. For the recorded audio, and for the textual materials like emails and phone. Daily Caller: All textual material? Binney: Any kind of textual material is relatively easy to get. The audio is a little more difficult. Now I don't think they're recording all of it; there are about 3 billion phone calls made within the USA every day. And then around the world, there are something like 10 billion a day. But, while they may not record anywhere near all of that, what they do is take their target list, which is somewhere on the order of 500,000 to a million people. They look through these phone numbers and they target those and that's what they record. For the last eight years or so, I've always operated with the assumption that all my phone calls were being recorded and listened to. Like many other journalists in the alternative news industry, I take many precautions to protect my privacy from rogue governments and dangerous corporations that would love to have me silenced. But compared to my own precautions against spying, very few Americans take any precautions whatsoever with their privacy. They physically live at the property address they use to receive mail (HUGE mistake), they put their own names on their real estate assets (another HUGE mistake), they divulge personal secrets over the phone to their friends, family members or secret lovers (yet another HUGE mistake), and they use email as if it were encrypted and private -- even though it isn't. The average American takes zero precautions to protect their privacy, and as a result they have no safety from a rogue police state government. By the way, there's probably enough evidence already ripped and archived by the NSA to destroy almost any targeted person in one way or another. And that's the real power of the NSA: not to stop terrorists but to blackmail top U.S. officials and corporate leaders into doing what the NSA wants them to do. The NSA also has the unlimited power to monitor the executives of public corporations and use that knowledge to conduct insider trading on the stock market as a massive fundraising engine with endless profits. This was already described a year ago in an article by Jon Rappoport. The NSA claims they are not abusing this seemingly infinite power to manipulate the lives of people. This statement, even if true, is irrelevant. The very fact that such a spy apparatus exists means the most evil people in government will seek to control it and use it as a weapon against their political enemies. Sooner or later, the NSA's spy grid technology will fall into the hands of the most evil-minded people imaginable... if it hasn't already. Imagine the abuses if someone like Feinstein, Obama or Bush had total control over such a system. They would obviously use it to threaten and blackmail not only their political enemies but also members of the press who wrote articles criticizing their actions. By some accounts, this is already happening. Or what if someone far worse comes along and manages to deceive enough voters to attain the White House? That person would inherit not only the NSA but also a nationwide police state infrastructure (DHS, TSA, FBI, etc.) that could be instantly turned against the people while declaring himself the absolute ruler of America. See, a government which has no limits will sooner or later grow into a monstrosity. And positions of great power tend to attract the most evil, power-hungry, destructive people of all -- people who enjoy dominating others. So the more powerful the U.S. government becomes, the more it attracts the kind of sociopathic control freaks that we already see in people like Obama. But Obama is just a small taste of things to come. If this spy state infrastructure is not dismantled, it will sooner or later fall into the hands of a police state dictator of such evil and destruction that he could use the technology to completely destroy America from within. There is speculation this may already be happening under Obama, actually. Why did Chief Justice Roberts suddenly change his mind and vote to uphold the "individual mandate" of Obamacare? As I wrote here on Natural News (which Glenn Beck then took and made into his own story), it could be because the NSA used Roberts' own emails and phone calls to blackmail him into changing his vote. In fact, there could already be countless cases of the NSA using its god-like powers to blackmail people in key positions in the U.S. Senate (which is full of pedophiles and perverts), the House of Representatives, the State Department or even the US Supreme Court. There are virtually no limits to the abuses of this power. Given time, the NSA will run America (if it doesn't already). Power flows to those who hold the most secrets over everybody else, and nobody holds more secrets than the NSA. If this organization is not de-funded or somehow operated with extreme oversight and transparency so that the People have control over its actions, it will become the single greatest threat to the privacy, safety and liberty of the American people. 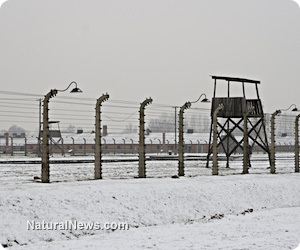 Mark my words: When America ushers in the next great holocaust, complete with mass graves and the rounding up of millions of "dissidents" under the pretext of "protecting the government from its enemies," the whole thing will be powered by the NSA. That's how they will know who to round up and execute. They will actually parse your phone calls and emails using a keyword weighting system to determine your "dissident score." If your score crosses a numerical threshold, you get "disappeared" and bulldozed into a mass grave somewhere. What IBM did for the Germans -- providing key technology to process and execute Jewish prisoners -- the NSA will soon do for a tyrant in the White House. The existence of this technology is a threat to us all not necessarily because of what it is right now but because of how it might be abused in the near future to carry out the mass murder of innocents. The NSA spy grid is, by all accounts, Hitler's greatest fantasy of domineering control. Its very existence is a threat to our survival.